A high-level federal court on Friday delivered a blow to the rights of military reservists. The case involved a Navy reservist who claimed that his civilian employer fired him because he was mobilized and deployed to Afghanistan, a violation of federal laws designed to protect reservists from discrimination based on their military service. But Kevin Ziober lost his case before the Ninth Circuit U.S. Court of Appeals, one step below the U.S. Supreme Court, which ruled that his pre-employment arbitration agreement prohibited him from suing his former employer. And although the court ruled against Ziober, the judge appeared to urge Congress to consider changing or strengthening the 1994 law, the Uniformed Services Employment and Reemployment Rights Act, or USERRA. "If we have erred by construing [USERRA] too narrowly, Congress will surely let us know," Circuit Judge Paul J. Watford wrote in a concurring opinion released Friday. The USERRA law requires employers to allow reservists to return to their civilian jobs after periods of active-duty service. Ziober testified before Congress in June, describing his experience and the need to strengthen the law. Ziober was a Navy lieutenant in 2012 when he was working for a California real estate management company, BLB Resources. He was fired on his last day of work before deploying to Afghanistan. The company said he was fired for reasons unrelated to his military service. However, when Ziober started working for BLB Resources, he signed an contract agreeing to resolve outside of court any future legal disputes with his employer. Such arbitration agreements typically bar employeees from filing lawsuits. 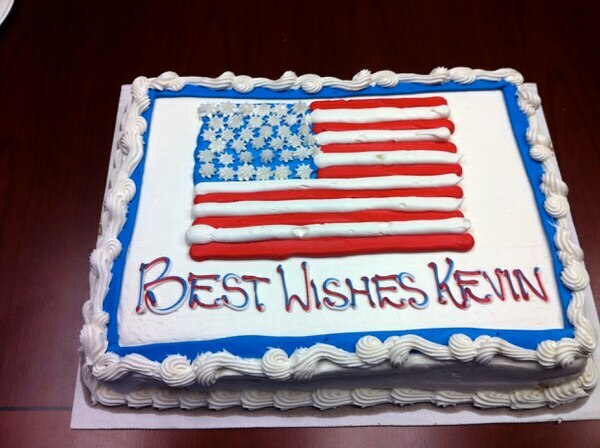 Navy Reserve Lt. Kevin Ziober's coworkers threw him a farewell party with a cake just before his 2012 deployment to Afghanistan. Ziober said the company fired him later that afternoon, prompting the reservist to sue his ex-employer for discrimination based on his military service. Ziober tried to file a lawsuit in federal court after he was fired. It alleged discrimination in violation of USERRA. But that lawsuit failed when a district-level federal court said the arbitration agreement stripped Ziober of his right to sue under USERRA. Ziober’s attorney suggested the ruling could harm military recruiting and retention, and ultimately impact military readiness. "USERRA is there to protect the rights of service members and veterans, and without USERRA rights, and enforcement of those rights, [National] Guard and reserve members can’t do their duty with the confidence they need that they can get back to their jobs and put food on the table for their families," said Peter Romer-Friedman, a Washington attorney who has represented numerous reservists with USERRA claims. "When court decisions take away USEERRA rights, they weaken our armed forces, they make us less safe and less secure." The appellate judge acknowledged that Ziober made a strong case. But the USERRA law does not specifically include language stating a power to legally supersede arbitration agreements. "With reasonable arguments to be made on both sides, I don’t think it’s prudent for us to [reverse] the district court’s ruling, particularly given the ease with which Congress can fix this problem," Wagner wrote. "If we and other circuits have misinterpreted the scope of [USERRA] Congress can amend the statute to make clear that it does render pre-dispute agreements to arbitrate USERRA claims – unenforceable." Connecticut Sen. Richard Blumenthal, a Democrat, has proposed a law that would eliminate any ambiguity in the USERRA law and state explicitly that service members cannot be blocked from the court system by arbitration agreements. Ziober remains in the Navy reserve and is now has a federal civilian job in California.